RMO Papers 2017 - RMO Question Papers / Solutions are now available officially for the exam conducted on 8 October 2017. 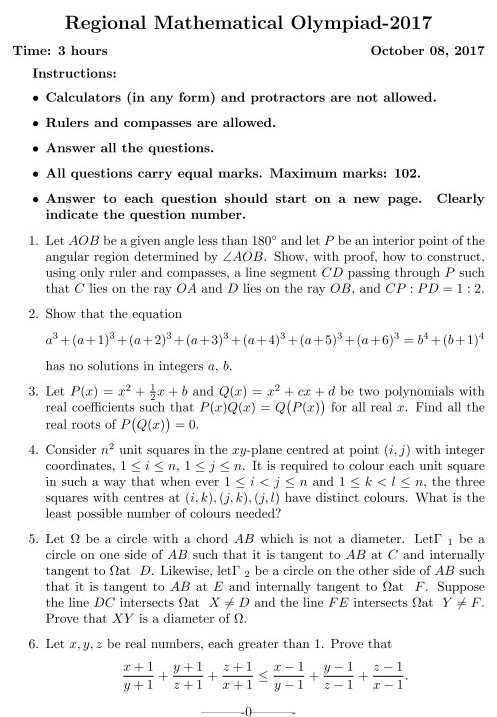 The candidates who have appeared in Regional Mathematics Olympiad can check and download the RMO Question Papers along with their solutions. RMO 2017 is an Olympiad conducted to test the mathematical and analytical skills of the students. The Olympiad for RMO is organized by the Homi Bhabha Centre for Science Education (HBSCE). RMO stands for Regional Mathematical Olympiad which will be held in all the regions on 8 October 2017 (Sunday). Based on the RMO exam, the final list of 30 top students including the five girl students will be sent by each regional coordinator to HBCSE by 30 November 2017. Get the RMO Papers and RMO 2017 Question Paper Solutions on this page. The RMO Question Paper and Solutions are provided here for the convenience of the students who are either going to participate in RMO in future or who have already appeared in RMO Exam which was held on 8 October 2017. Scroll down to get the RMO Papers and Solutions. RMO 2017 Solutions for the exam conducted on 8 October are given below. 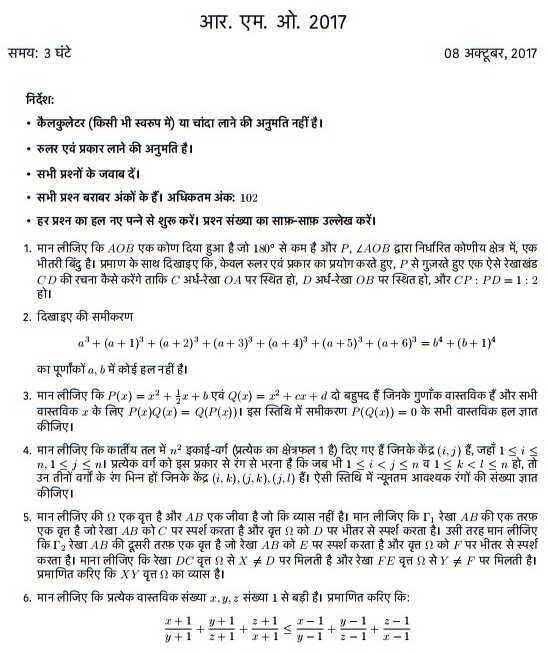 Students can check the solutions of 2017 exam given below. For any Queries related to RMO Papers/Solutions 2017, You can write to us in the comments section below.